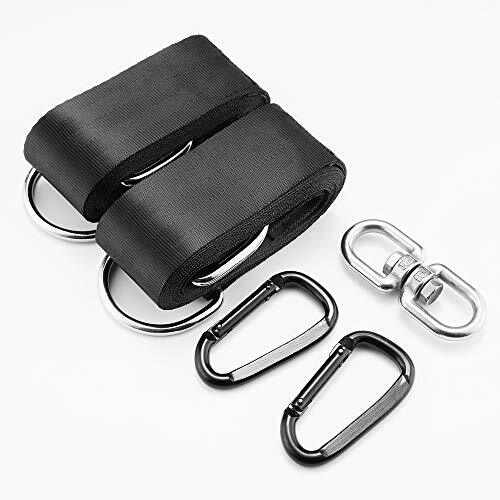 EASY TO INSTALL AND DISASSEMBLE: the straps is very easy to install ,you install them that need not use drilling or tools and you can finish it in under 5 minutes, it is adjustable ,straps can work with any size hammock and fit. In addition, if you do not want use it ,you also can easy to disassemble it . SAFE: The swing hanging straps adopt high-density High-Grade Industrial nylon and stronger durable D-ring, have SGS identification ,Heat-resistant and waterproof function,to withstand harsh winters and brutal summers.Bring enough safety and comfort to your outdoor activities. INCLUDE: The Tree Swing Hanging Kit include 2 tree swing straps,2 heavy duty carabiner,1 bonus spinner,1 bag ,1 user manual. 100% REFUND GUARANTEE: We have great confidence in the quality of our products and we believe you will love this tree swing strap kit that it is backed by our 100% Money Back Guarantee, We provide unconditionally refund or free replace if defective or any quality problems. High quality straps that get the job done! Very strong and sturdy, Feels like can handle weight and wear and tear.